In A DUCK SO SMALL the big ducks said to little duck Duffle, “’A duck so small can do nothing at all!’” Duffle thought sadly, “I may be small, … , but there must be something I can do.” Duffle tried unsuccessfully time after time to do all the things that other animals could do. But, when a baby duckling needed to be rescued, Duffle was the hero because he was just the right size. “’A duck so small can do something after all!’” said one duck. And, although Duffle said, “’Oh, it was nothing,’” he knew it was quite something! Self-esteem has gotten a bad rap over the years – “too soft and fluffy” “encourages over-indulgence and feelings of entitlement.” My response is yes, we are indeed seeing much too much overindulgence and entitlement going on in families, but too much emphasis on self-esteem is not the problem. The problem is that too many parents, grandparents, teachers and those taking care of children do not understand what self-esteem is. A child who expects everything to be handed over to him and never to be responsible for his behavior does not have high self-esteem, no matter how full-of-himself he may seem. You deeply believe you are worthwhile and cared about – just because you are you. You deeply know you can do things well –you know how to take care of yourself and how to live with others by following necessary rules and expectations. These two ingredients in equal amounts and with equal enthusiasm are kept in balance to the greatest degree possible. So readers, if you cannot buy into this definition, if you think self-esteem is all about giving complements that you don’t really mean, letting people off the hook and being careful to never allow someone to be sorry or sad, you will disagree with what I have to say about wanting children to build high self-esteem. For me, it’s all about balance – balancing both parts of self-esteem. This is what was going on in our featured picture book, A DUCK SO SMALL. If you have read this to your children before, you know how much children identify with Duffle and his need to be able to do something well. Children naturally want to learn to do things. They want to become more and more independent. Amazingly, this includes wanting to know the rules, know what the consequences are for not following the rules and know that they can make up for things they do wrong and get back into good graces when they mess up. They may think, act and say they want to be the center of the universe and be taken care of, but those that are treated this way are not happy, healthy or successful kids. Neither will they likely be happy, healthy or successful adults later on. Amazingly, although they have been told over and over how great they are, they often don’t really believe it. Some of the things they believe instead are: 1) they don’t really know how to take care of themselves; 2) they are dependent on others whom they are not sure will come through for them in the end and 3) no one really cares about them except when they are stand-out performers – the ones winning the awards and not ever needing help. Unless we attend to both the nurturing part of self-esteem and the teaching of rules and skills part of self-esteem, children can get out-of-balance. My image of this idea is a teeter-totter. 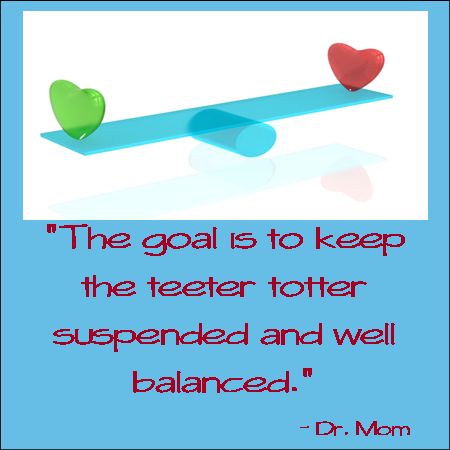 The goal is to keep the teeter-totter suspended and well balanced. 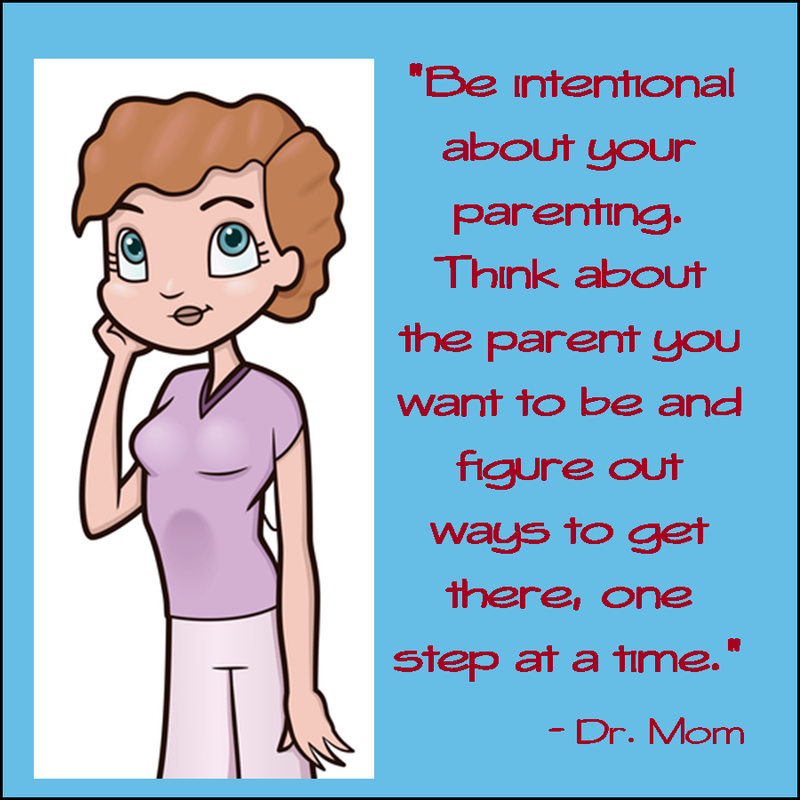 On one side, we load up messages and actions that tell a child that they are important to us no matter what. On the other side, we pile on messages and actions that tell a child they can learn things; they are expected to learn things and you’ll help them learn what they need to know to be happy and independent. When both parts of self-esteem are well balanced, a child has their best chance in life. When my children were small and things seemed to be going downhill at our house – unhappy, squabbling, unproductive kids and adults, I spent some days actually tracking my words and actions. How many were in the category of “love you; you’re great,” patting, hugging, etc. and how many were in the category of teaching skills, setting rules, enforcing rules, praising accomplishments, etc.? I usually found the two lists to be quite out-of-balance – sometimes in one direction, sometimes in the other. It didn’t matter in which direction they were out of balance. The result was the same — chaos. My tactic after seeing my list was to beef up the weak side of the teeter-totter with more messages and actions in that category. More often than not, things evened out and calm fell over the household. We will post new parenting thoughts on the 1st of February. Here’s a preview. We are going to feature KNUFFLE BUNNY (Mo Willems) and talk about communicating with young children. It’s OK to read ahead. The book can be found at your local public library or bookstores, including online stores. I enjoy you and want to be with you. I enjoy you when you are quietly just being you. I enjoy you just as much when you are busy and into everything. I love to watch you grow and learn to do new things, including how to follow rules.